Bronze and glass sculpture of a horse in Danae Bennett-Miller. 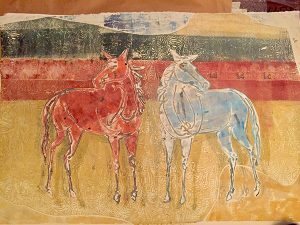 Sculptor and printmaker, Danae Bennett-Miller opens her show, “Fragile Beauty, Strength of Spirit”, at Tumalo Art Co., October 6, from 4-8pm during the First Friday Gallery Walk. Well-known for her public sculptures, Danae captures the spirit of both wildlife and ranch animals in her organic works. Danae Bennett Miller’s one-of-a-kind bronze sculpture is part of the cultural landscape in Bend with public sculptures in Downtown Bend and Sisters. She fabricates each sculpture from many individual parts using a lost wax process. But rather than sculpting the wax into a model, she pours it out in slabs. The ragged slabs then become the building blocks for the sculpture. A foundry translates the shapes into bronze, and Miller adds the patina herself. Recently she has begun to add molded glass to her sculptures. Many of Danae’s sculptures are tabletop size which make acquiring one possible for all levels of collectors. Danae started working in wax in 1978 in undergraduate school while majoring in sculpture. She continued in graduate school adding more knowledge of process and casting and developing an understanding of the material over time. “The fluid nature of the material lends itself to the energy I am seeking to convey in the sculpture. The wax sheets allow me to focus on a balance between the positive and negative spaces in the sculpture”, says Danae. 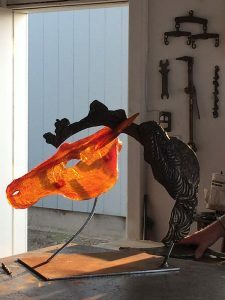 In addition to casting bronze, aluminum and stainless steel, she often includes additional materials such as rock, steel, patina or paint, water elements, light (neon) and cast glass for some pieces. Utilizing her love of drawing and expression, Danae has found printmaking to be a complimentary medium to sculpture and natural addition to her craft. Her original prints show exquisite use of line, marks and subtle color. Embossing and shaping paper over forms she creates adds to the sculptural effects of this 2D process. Danae’s work is Influenced by my natural surroundings, and fueled by the textures, colors, and energy of life force. Tumalo Art Co. is an artist-run gallery in the heart of the Old Mill District in Bend, Oregon and is open 7 days a week.